Work-at-home jobs for pet lovers are everywhere if you know where to look. Flexible and home-based opportunities for animal lovers are in demand now more than ever and are growing more and more popular every day. If you're a pet lover looking to work from home, here are some options for you to consider. Paw Tree is a company that sells a wide variety of products for both dogs and cats. You earn 10-20 percent on everything you sell, plus ongoing bonuses for gathering loyal customers. Build a team of other Pet Pros and make 1 – 7 percent on their sales as well as other rewards. Life's Abundance sells supplements, treats, food, pet care products, and gifts for dogs and cats. They are passionate about helping you lead an abundant life with your own home-based business. Pet Sitting is probably the most familiar way to work-at-home if you're a pet lover. Only it's usually not at your home but the pet owners! Still, feeding and playing with a cute dog or cat all day is my idea of a good day at the office! Plus many times owners just want you to check in, feed, give medication, or clean up after their pets. This means you could have multiple clients that you work with every day, which is an excellent way to increase your income. Many people don't like taking their pets to the groomers. It can be inconvenient, especially if you work during the day, to have to leave, and take in your pet during business hours. A mobile pet groomer solves this problem completely! You travel to the owner's home whether it be in the daytime while they're at work, in the evening, or on weekends. Learn about other side businesses you can start here. Becoming a dog walker is the perfect part-time job for dog lovers, although it is possible to work full-time. Here is an honest look at being a dog walker by someone who does it for a living. Platforms like Wag, Rover.com, and Care.com connect dog walkers with dog owners in their community seven days a week. These on-demand sites also let you provide dog sitting and dog boarding services. Visit each of their respective websites to see if they're accepting dog walkers in your neck of the woods. Unlike being a dog walker, owning and operating a doggy daycare is a bit more than just walking a dog. Owners who are either busy for a day and don't want to leave their pet home alone or who are from out of town often need a place for their pet to stay for a day or two. Opening up your home to be a doggy daycare could be a stellar work-at-home job opportunity! You control how many clients you accept and on what days. This is one work-at-home job that could have the potential to eventually move out into a brick and mortar business if you get enough clients. If you have a vast knowledge about pets and animals in general, why not share that knowledge with the world? By starting a blog about your favorite animal, you can provide useful information to other pet owners who might be looking for help. You can make money blogging about pets from a variety of sources that could include affiliate links, ads, and selling products. Interested in starting your very own pet blog? Let us walk you through it step by step here. The market for pet products is huge! This is one pie you might want to get a piece of if animals are your passion. You can create everything from toys and clothes to treats and food. Creating pet products is great because you get creative freedom to do what you want. Your products can be sold at craft fairs, in small boutique retail stores, or online at sites like Etsy and Amazon. You can also have an online store that sells other people's pet products. You can sell products handmade by others or drop shipped (sent directly to your customers) from a major company. Are you a dog lover who wants to work-at-home? 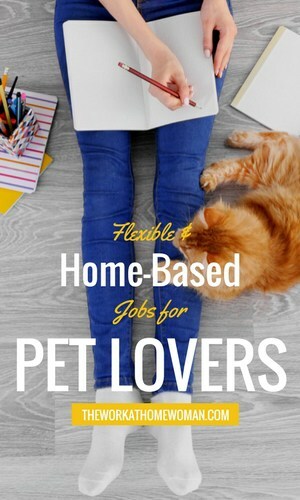 Check out this post for more work-at-home jobs for pet lovers! Do you know of any other work-at-home jobs for pet lovers? Share them with us in the comments; we'd love to hear about them! Kimi Clark is a career stay at home mom turned writer and blogger for hire with a passion for business. She specializes in posts about writing, blogging and entrepreneurship, as well as all things parenting and motherhood. Owner & Founder of The Mom Shopping Network, she helps moms find great tips, amazing products, money-saving deals, fun entertainment and what’s trendy and hip for moms, dads, and kids! A devoted wife and mother of four, she loves the beach and NEEDS her early morning coffee. Thanks for letting me know, Jessica. I’ll have to update the information. You can talk to your vet or pet store. You can also consult with a pet sitter. I would love to learn how to take care of my pet in the best way possible. I would like to make sure that I can find a doggy care for when I go on vacation. I want to get some help choosing some care to help out on a regular basis. Hi! I am a pet sitter with Go Fetch. Check out our website http://www.gofetch.ca for the best pet care!